The CycleSafe Rail-Mount Bike Rack is a portable, multi-bike parking unit that allows for removal of the racks for snow plow or seasonal use. The 6-bike capacity rail-mount bike rack by CycleSafe can be furnished with any combination of classic, vintage, or modern surface-mount racks. The rail-mount bike rack can also function as a bike corral, providing an opportunity to promote bike accessibility to local businesses and to enhance street and neighborhood life. A bike corral transforms a standard parking space or pedestrian walkway with a corral for bikes. Additional pavement markings and buffers such as rubber parking blocks, bollards, or planters are recommended to delineate bike parking from traffic areas. Local parking ordinances and codes must be referenced prior to placement with visibility for night use to be considered. 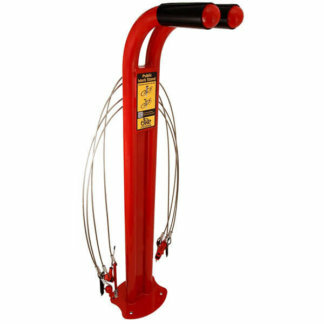 CycleSafe Rail-Mount Bike U Racks are designed for portability and easily maintained for street debris or snow removal. They may be bolted in place as required. Contact CycleSafe for special order hardware. 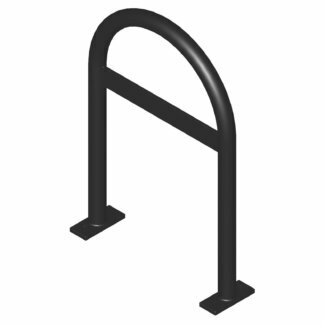 Rail-Mount Bike Rack dimensions are 37 1/8″ high and 72″ long. Stainless steel tamper-resistant hardware is included: 3/8″ x 1 1/2″ stainless steel screws with clamping nuts. Permanent rail mounting hardware may be ordered on special request.